BBC Studios & Post Production - Bankside Systems Ltd.
BBC Studios and Post Production provides technical resources and craft skills in television production to the BBC and other broadcast organisations. 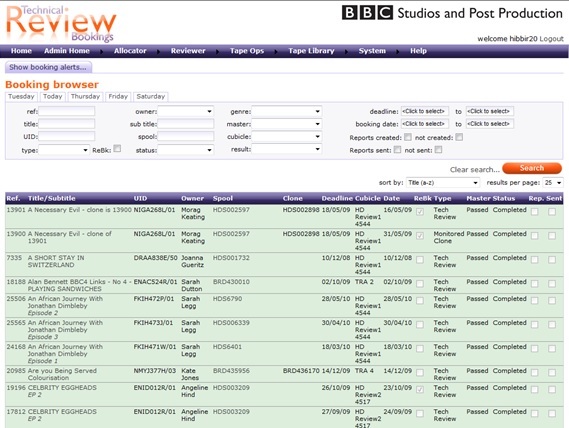 They required a bespoke booking and workflow system to manage technical and quality control reviews of transmission material for BBC Television. Having worked extensively with the organisation for many years on various people and resource scheduling systems, including interfaces to corporate level finance packages, BBCS&PP chose Bankside Systems to design, develop, implement and support an intranet based solution to meet their Technical Review requirements. Our solution, developed from the ground up using Microsoft .NET technology, provided a fully browser based interface for both internal users and external clients alike and was ahead of its time in several technical areas.